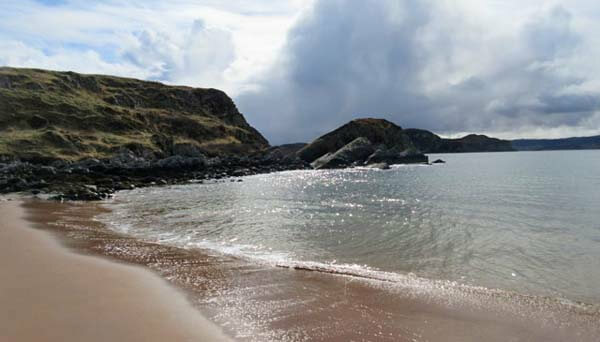 Taighali is situated on the shores of Loch Ewe, in a quiet, peaceful area 3 miles from the village of Aultbea in the north west Highlands of Scotland. 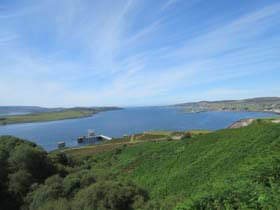 Loch Ewe is a natural deep water loch that was used as a naval base during the Second World War. It is a beautiful and tranquil setting, an ideal place to relax with lovely views from every window, some towards the Torridon mountains. There are many scenic walks in the area, both along the coast and inland, to suit different levels of walkers. On your travels look out for the cave at Cove, the wreck of the USS William H Welsh, the cave at Sand, Beast Loch and Fionn Loch. From Taighali it is a 5 minute walk to a nice sandy beach with many other beaches within a half hour drive by car. There are mountains to climb, hills to walk and also many outdoor activities available locally including golf, pony trekking, canoeing lessons, fishing, sea life cruises and bird watching. A drive around the loch, from Mellon Charles to Cove on the west-side is 17 miles, mostly on single track roads and can easily be done on a bike as well. You will be pleasantly surprised by the beautiful and ever changing light conditions, perfect for artists and photographers. While you are in the area, Inverewe Gardens is a must! It's recognised as one of the finest gardens in Europe, mainly due to the climatic effects of the Gulf Stream, so plan to spend some there and explore this extensive garden whatever the season. There is a perfume studio and restaurant about 15 min walk from apartment. The Perfume Studio design and make an original range of perfumes, fragrances, skin creams, toiletries and soaps and have a bright and airy caf� with spectacular views across the loch towards the Torridon mountains. There are many tearooms and craft shops in the area, Aultbea has a post office, a local shop which sells many items from daily papers, to fresh milk, post cards and all kinds of food and the local hotel is open for meals. If you're looking for a quiet holiday in a remote location where you can just sit and enjoy the peace and tranquility you won't be disappointed. Ullapool and Inverness are only a one and a half hours drive away in case you have had enough of the solitude! 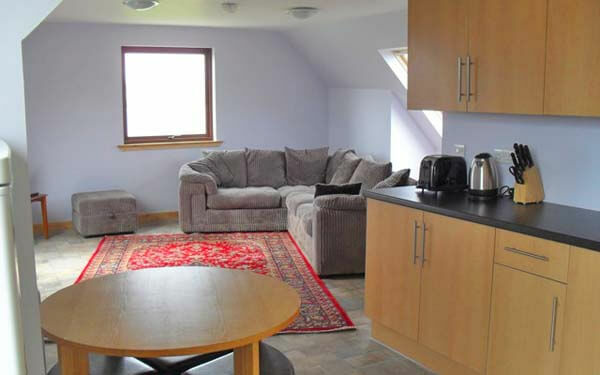 Taighali is a one bedroom upper floor apartment which provides spacious and comfortable accommodation and has far reaching views from all the windows. There is an open plan sittingroom/kitchen and dining area with space to relax and a TV and DVD player along with a radio and a selection of books. 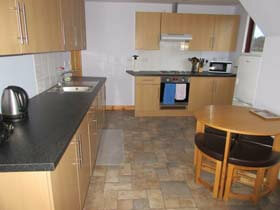 The kitchen is well equipped with a fridge/freezer, hob, oven and microwave. 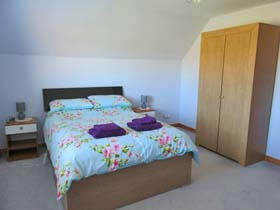 The double bedroom has a double bed plus a single fold away bed suitable for a child. There is also space for a cot. 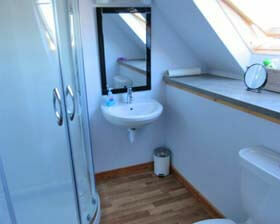 The shower room is modern and has a shower unit, WC and wash hand basin. The apartment is fully equipped including bedding and towels and benefits from oil central heating and water heater. A washing machine and tumble drier are also available for use. Outside is a garden bench for you to sit and enjoy the view. Follow the A9 from Perth to Inverness then take the A835 signed for Ullapool a few miles from Ullapool at Braemore Junction turn left onto the A832 to Aultbea. When you reach Aultbea come through the village and out past the village hall and keep going along the seaside and you reach Ormiscaig, keep going and you will reach Mellon Charles and you will see a sign saying MacKenzie 30 Mellon Charles. Oil central heating and electricity are included. Bed linen and towels are provided. Milk, tea, coffee, sugar and biscuits are there for your arrival. Taighali is available to rent throughout the year. Change over day is Saturday with check in 4pm and departure 10am. 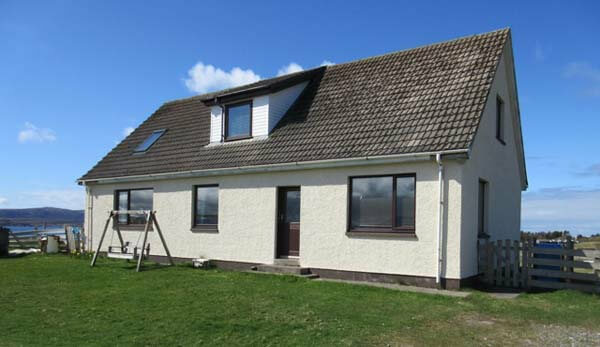 To enquire about this comfortable Aultbea accommodation with amazing views click the button below. This delightful holiday accommodation for 2 enjoys the most stunning views over Loch Ewe and offers a great place to stay to enjoy the north west of Scotland. A holiday in Aultbea has so much to offer - Inverewe Gardens, great walking, canoeing and cycling, as well as some of the most beautiful beaches in Scotland.